Home BOLLYWOOD Designer Masaba Trolled For Backing Firecracker Ban, Receives Support From Sonam Kapoor! Designer Masaba Trolled For Backing Firecracker Ban, Receives Support From Sonam Kapoor! Designer Masaba Gupta hits back to trolls like a boss, receives support from Sonam Kapoor and other Bollywood celebrities. Celebrity fashion designer Masaba Gupta recently got trolled after she supported the Supreme Court’s ban on the sale of firecrackers in Delhi NCR. 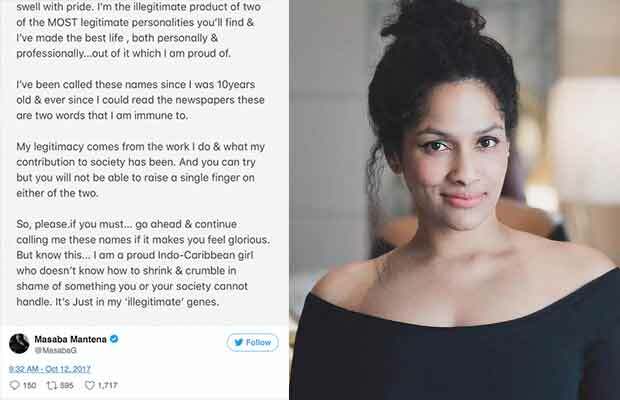 Now, Masaba hits back at trolls who allegedly referred to her ‘illegitimate West Indian’ on micro-blogging website Twitter. She was abused and trolled to a greater extent that it forced her to write an open letter. To people who don’t know, Masaba is the daughter of actor Neena Gupta and West Indian cricketer, Viv Richards. “Recently I retweeted in the support of the Firecracker ban by the Supreme Court and like every other issue in this country, big or small.. The trolling & bashing began,” her tweet read. “By calling me names like ‘b*s*ard child’ or ‘illegitimate west Indian’ it only makes my chest swell with pride. I’m the illegitimate product of two of the MOST legitimate personalities you’ll find & I’ve made the best life, both personally and professionally… out of which I’m proud of,” she further wrote. The tweet got thousands of likes and retweets. Soon Bollywood celebrities Chetan Bhagat, Huma Qureshi, Sonam Kapoor and others tweeted in support of Masaba. you are amazing, one of the truly most inspiring people I have met. learn from me. don't let 'em trolls get to you. you r bigger than that! Previous articleBigg Boss 11: Bandgi Kalra’s Boyfriend To Enter The House After Her Closeness With Puneesh Sharma? Next articleSplitsvilla 10: Not Priyank Sharma And Divya Agarwal But This Couple Wins The Show!